The great Katie Kate takes on the Worry Wombat as she teaches a young girl about treating cancer. When Dr. Demarco explains to Suzy that she might have cancer, the young girl begins to worry. Just then, the Great Katie Kate zooms in to ease Suzy's mind and help her stare down the Worry Wombat. She takes Suzy on a magical tour through the hospital and explains what cancer is all about and, more important, how it is treated. As Suzy learns more about her condition, she learns to ask questions and even to smile, which makes the Worry Wombat disappear. This superhero saga provides an entertaining and indispensable tool for parents and medical professionals who are seeking a positive way to set young cancer patients on the road to recovery by helping them deal with their fears. 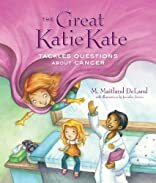 With Katie Kate coming to the rescue, children with cancer have a friend they can trust. About M. Maitland DeLand (Author) : M. Maitland DeLand is a published author. A published credit of M. Maitland DeLand is The Great Katie Kate Tackles Questions About Cancer.